This 1958 report, depicted noise as a thoroughly modern malaise: 'that the world is growing noisier is obvious to us all; towns, roads, buildings and even hospitals are all noisier than ever before’. In the surveys used for the report, patients often cited hospital equipment as a cause of noise on wards, with metal trays rattling on trolleys, squeaking trolley wheels, slamming hospital doors and dripping taps forming the backdrop that patients ate, slept and woke to. 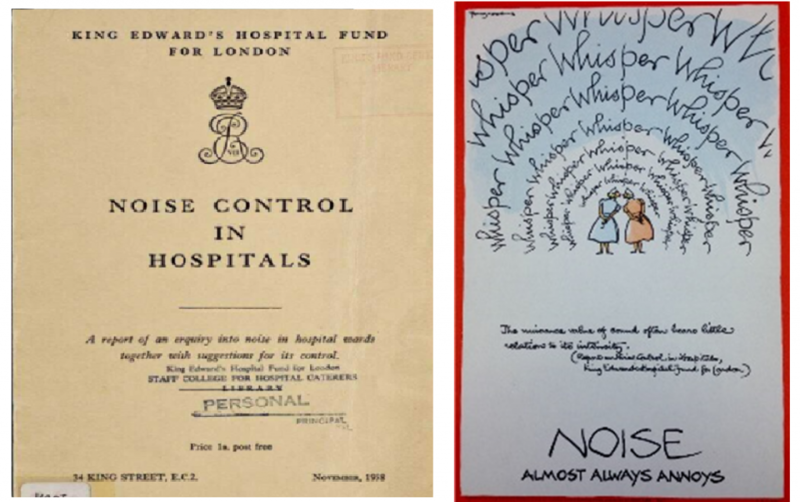 In an effort to demonstrate how easily small fixes could reduce hospital noise, The King's Fund commissioned the cartoonist and former Punch editor, Fougasse, to produce a series of informative posters aimed at hospital staff. Each poster depicted a key source of noise disturbance, as identified in the Fund’s research. This is fascinating in relation to the cultural history of the NHS. It highlights how this involves, not just a history of privatisation, but also of privacy.